With the new BMW M2 Competition (combined fuel consumption with six-speed manual gearbox: 10,0 – 9,9 l/100 km; combined CO2 emissions: 228 – 225 g/km*; combined with optional M Double Clutch Transmission (M DCT): 9,2 l/100 km; combined CO2 emissions: 210 – 209 g/km)*, BMW M GmbH is setting fresh benchmarks in the compact high-performance sports car segment and adding marked refinement to the character of the BMW M2 Coupé. New six-cylinder in-line engine with M TwinPower Turbo technology, based on the power unit from the BMW M3/M4, three-litre cubic capacity, 302 kW/410 HP, peak torque of 550 Nm (combined fuel consumption with six-speed manual gearbox: 10,0 – 9,9 l/100 km; combined CO2 emissions: 228 – 225 g/km*; combined with optional M Double Clutch Transmission (M DCT): 9,2 l/100 km; combined CO2 emissions: 210 – 209 g/km)*. Sprint from 0 to 100 km/h: 4.2 s (with six-speed manual gearbox 4.4 s), top speed: 250 km/h (limited), 280 km/h with M Driver´s Package (limited). High-precision CFRP strut and bulkhead strut for increased front section rigidity. New cooling system, including new front skirt and larger, redesigned BMW kidney in high-gloss black. New dual exhaust system with two electrically-controlled flaps. New, optional M Sport brakes with brake calipers painted grey. New optional M Sport bucket seat with integrated headrests and illuminated M2 badge at shoulder height. Selector switches for immediate access to various engine and steering characteristics, as well as DCT settings via Drivelogic. Exclusive new metallic Hockenheim Silver paint. 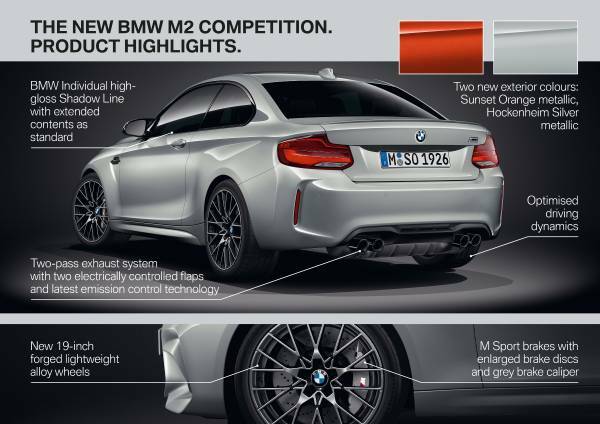 The BMW M2 Competition replaces its predecessor, the BMW M2 Coupé. Ciao a tutti, avrei una domanda: con l'aumento dei cavalli da 370 a 410 se non erro ed il cambio automatico, riesce a competere con una Porsche Carrera S da 420 cv sempre con cambio automatico? Mi scuso nel caso avessi scritto nel post sbagliato. Chasing records with the BMW M2 Competition. An eye-catching digital campaign presents the BMW M2 Competition (combined fuel consumption: 10.0 – 9.8 l/100 km [9.2-9.0]; combined CO2 emissions: 227 – 224 g/km [209-206]*) as a record breaker with very unusual tools: a high-power laser and a precision blade. The impressive films will be shown in BMW and BMW M social media channels. The BMW M2 Competition is out to break records. To deliver on this promise, the BMW M2 is drawing inspiration from world records set by humans. At first glance, these appear to have nothing to do with cars: cutting through more than 87 straw mats with a blade within a minute and popping over 63 balloons in 60 seconds with a laser beam. Uwe Dreher, head of Brand Communications BMW, BMW i, BMW M: "The BMW M2 Competition showcases BMW M genes in their purest form. It is an exceptional car with outstanding dynamic performance, presence and handling. With our digital campaign, we capture the heart of our target audience right where they live and inform themselves: in social media. We provide the BMW M2 Competition with the perfect stage to demonstrate its qualities in impressive style." For these spectacular challenges – attempted for the first time worldwide – a slightly modified BMW M2 Competition was brought to Cape Town. It comes with the same technology as the series-production vehicle, plus the additional features required for attempting the records: a high-energy laser installed into the front of the vehicle and a blade attached to the rear. Following meticulous planning and testing, the course was set out and everything was ready: Rolled-up bamboo mats were arranged in semi-circles so that they could be cut by the blade on a drift; the balloons were set up in long straight lines angled sharply towards each other for quick turns. Fans will instantly recognise the shape of the letter M, the most powerful letter in the world. 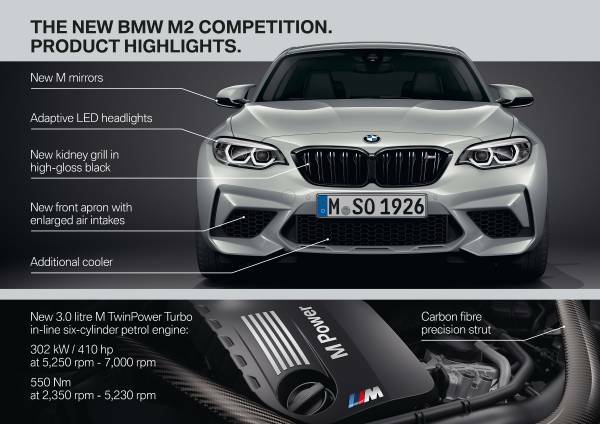 Technically, the BMW M2 Competition already has everything it takes to be a genuine record-breaker: At its core is a new engine based on the power unit used in the BMW M3 and BMW M4. The inline six-cylinder engine with M TwinPower Turbo Technology produces 410 horsepower and accelerates from 0 to 100 km/h in 4.4 seconds. 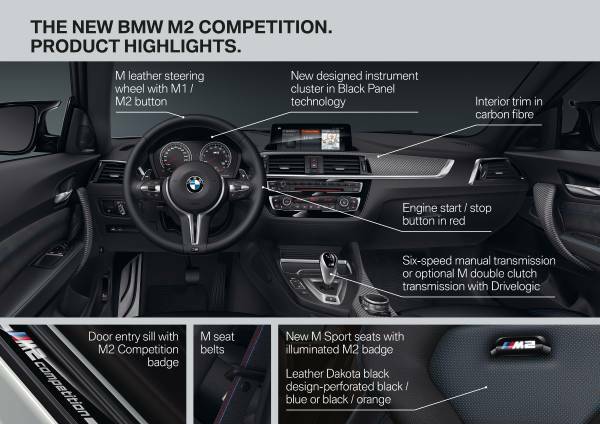 For the first time, BMW M2 drivers will be able to use two selector switches in the central console to directly adjust various characteristics and settings for the engine, steering and Drivelogic functions, if M DCT is available. Optically, the BMW M2 Competition also shows its most expressive side: The revised front apron with a bigger, redesigned high-gloss black BMW kidney grille and the exclusive new Hockenheim Silver metallic finish give the BMW M2 Competition an even stronger presence. “This challenge is now reaching its finale, after months of preparation. The driver is an expert in his field, but he needs the car to respond precisely to the slightest feedback from him. If the car does not respond, we will not break this record,” explained director Oison Tymon. And the BMW M2 Competition kept its promises: Despite the complexity of the challenge, the high-performance sports car broke both records. After just a few attempts, 117 bamboo mats were cut and 79 balloons burst – both in precisely one minute. To proof the authenticity of the stunts, real-time drone footage was captured of the BMW M2 Competition performing the stunts. The BMW M2 Competition’s record-breaking attempts are part of the “Same street. Different game.” launch campaign and fit the tonality of the campaign perfectly. The extroverted motifs also reference the world of gaming, with high scores and record-breaking runs. That makes sense: From the start of communications, millions of fans worldwide were able to experience the new BMW M2 Competition virtually, within just a few hours of its world premiere at the Beijing Motor Show, in the popular mobile racing game CSR Racing 2. Quanto costa all'anno mantenere una macchina del genere? Credo che il vero problema siano bollo+superbollo. Tra gli scarichi presenti sul mercato, secondo voi quale ha il sound migliore? Io non me ne intendo molto ma guardando su youtube tra i vari preferisco Armytrix. Hai perfettamente ragione, pensando ai costi si diventa matti. La mia era solo una curiosita', magari qualcuno del forum ne possiede una e mi poteva dare delle dritte. Considera che faccio circa 15.000 Km. all'anno e non ho famiglia, nel senso che non devo mantenere nessuno. Non mi occupo di soldi lavorativamente parlando ma secondo me una persona che guadagna almeno 30.000 Euro all'anno e non ha mutui ce la fa a mantenerla.